Do you have a habit of creating shortcut icons of your favorite applications on the desktop for easy access? If yes, it is very important that you properly group and arrange the desktop items before your desktop starts looking messy. Moreover, as you tend to add more and more shortcut icons to your desktop, you will find it difficult to locate a desired application. However, you can take care of this issue with the help of Fences, a grouping application by Stardock. This free Windows enhancement helps you organize your desktop shortcuts effortlessly by grouping the shortcut icons into fenced blocks with labels. You can add shortcuts to the suitable block and arrange them accordingly. For example, you may create a block “Microsoft Office” and include the shortcut icons of MS Excel, MS PowerPoint and MS Word into this group. You may also create a block named “Games” and fence all your computer games into it. With Stardock Fences, you can basically enhance the look of your desktop along with the accessibility. 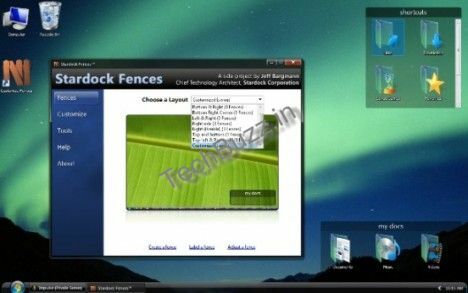 Stardock Fences is simple to use and extremely flexible. For creating a fence, you need to right-click on the desktop and simply drag your mouse pointer to draw a rectangle. It is also possible to resize or rearrange the fences as and when necessary. Although the desktop shortcuts are better organized into fences, if you still feel that your desktop looks crowded with lot of fences and icons, Stardock Fences offers another feature “Quick-Hide Activated” to deal with this. This feature is able to hide/ show all the shortcut icons with a simple double-click on any blank space on the desktop. Quick-Hide Activated feature in Stardock Fences also allows you to keep some selected fences or icons visible while you quick-hide the others. For doing so, you need to right-click on a fence and select the option “Exclude from Quick-Hide”. This application can be downloaded free of charge from Here. Stardock Fences supports 32 bit as well as 64 bit versions of Windows Operating Systems such as Windows Vista, Windows XP and Windows 7.